Colchester High School is Colchester’s only independent school for girls and boys aged 2½ to 16, uniquely able to offer an excellent family-friendly education to children from Nursery through to Year 11. The foundations of this success are laid in our all-year-round Nursery, where our experienced practitioners engage each child with an individually targeted blend of free-flowing play and formal learning in phonics and maths. It is built on in our Lower School, where we offer a broad curriculum designed to help each pupil progress at the right speed. And it is completed in our Senior School, where our subject-specialist teachers help pupils meet our high expectations. The School offers a traditional academic education to educate our students to the very highest standard. Abroad and balanced curriculum and experienced, friendly and supportive teachers allows for a clear focus on the strengths of each child. The progress of pupils is regularly and individually monitored to encourage exceptional progress and identify areas for development, ensuring each pupil achieves individual success. As a school we strive for every pupil to achieve their very best in terms of academic achievement, but we also firmly believe that education should develop children’s character and wellbeing, inspire a love of learning and culture, create a curiosity about the world and people around them preparing them for life. It is for these reasons that we encourage all our pupils, from Nursery to Year 11, to participate in our character development programme, the “Wellesley Award”. Colchester High School Nursery is a place where children flourish. A place to play, laugh, smile and make friends. A place to grow, develop and become happy confident little learners. Our experienced Nursery practitioners have created a homely environment carefully designed to make each child feel safe, secure and confident. In the warmth of our classroom setting and in the stimulating space of our Early Years garden, you can find children engaged in a wide range of activities, exploring and developing their social, emotional, physical and intellectual capabilities. We offer a blend of free-flowing play and formal learning, setting specific targets for each child within the EYFS. The children enjoy structured Maths lessons and follow the ‘Read, Write Inc.’ literacy programme. 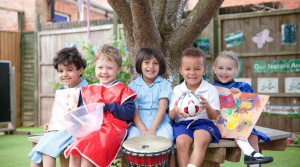 They also receive specialist teaching in PE, ICT, music, drama and languages – one huge advantage of the Nursery’s links to the rest of Colchester High School. It’s a combination that works. Nationally about 71.5 per cent of children are expected to achieve a good level of development during this stage of their education. At our Nursery, that figure rises to 100 per cent. Colchester High School Nursery is open all year round but parents are only required to commit to term-time sessions. You can then book holiday sessions as required on a day-by-day basis, giving you flexible access to our outstanding Nursery provision. To find out more or to arrange a personal tour, please contact the Registrar on 01206 217116 or visit our website at www.colchesterhighschool.co.uk/nursery.